Welcome to the website of the Silk Street Swing Band. 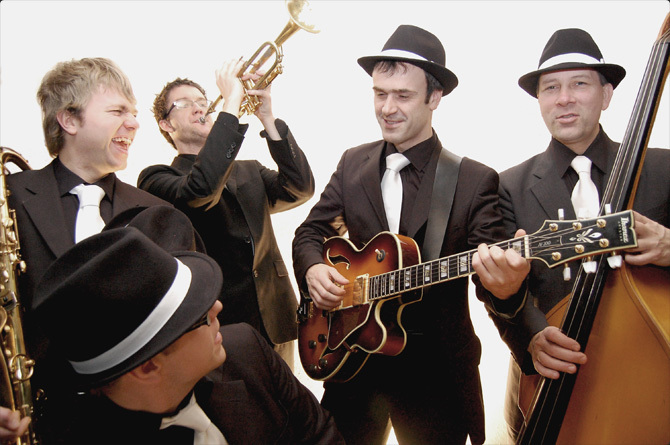 We are a sharply dressed, sensibly priced, professional jazz swing band for hire. We’ve helped bring countless weddings, corporate events and parties to life with our sophisticated jazz sound and swing band music and we’d love to do the same for you. With a vast list of songs on our repertoire covering a wide range of jazz styles, we have an extensive list of songs to choose from. So whether you are looking for a traditional 1920’s jazz band to serenade you at your wedding or a rat-pack band to hire for your upcoming party, we have something for everyone. Silk Street Swing will cover all the classic swing hits including songs by Dean Martin, Bobby Darrin, Nat King Cole & Frank Sinatra. We also love to perform modern swing classics from the likes of Michael Bublé, Jamie Cullum and Robbie Williams. If you are looking to hire a talented Swing Band then we have a choice of carefully constructed bands to enhance and add that finishing touch to your special day. Low-key or big party? Consider it done. Our choice of line-ups can be specifically tailored for and intimate gigs through to party foreground entertainment, and even somewhere in between! With solo options right through to six performers and a full cabaret show, if you are looking for party ideas or a swing band for hire, then we are the jazz band to book.